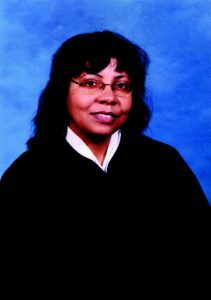 Judge Ramona L. Emanuel was elected as Caddo Parish Judge in Criminal Section 4, Division B in the First Judicial District Court in November, 1995. She now serves as Deputy Chief Judge. Before serving in her present capacity, she held the position as an Administrative Law Judge for the State of Louisiana, Department of Workers’ Compensation, where she presided over trial and other proceedings concerning workers’ compensation claims. She worked as an attorney in a law firm and worked as an attorney for Child Support Enforcement. Baton Rouge, Louisiana in 1986. She also has a Bachelor’s Degree in Journalism from Louisiana State University in Baton Rouge, Louisiana acquired in 1981. Judge Emanuel is married to Mr. Kenneth Williams. He is a teacher at Woodlawn High School. Judge Emanuel believes in giving back to the community by speaking to students in public schools. For example, she recently presided in a courtroom re-enactment of the famous Dred Scott case with a group of students at Woodlawn High School in Shreveport for history class.